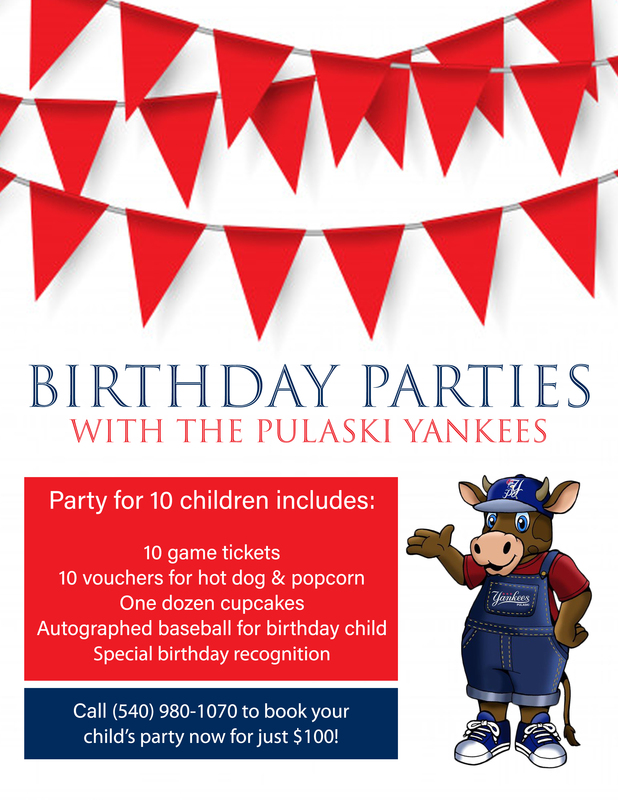 Click the image above or button below to purchase individual game tickets for the 2019 Pulaski Yankees season! For more information on season ticket plans and benefits, click here or call (540) 980-1070. To purchase flex tickets, click here. Secure your seat for all 34 Pulaski Yankees home games in 2019, plus potential playoffs. Season tickets are on sale now! Call (540) 980-1070 to get yours. Summer is a busy time, but Pulaski Yankees flex tickets allow you to come to ANY 2019 home game that fits your schedule. Call (540) 980-1070 or purchase online now. Have a group of 10 or more people who want to enjoy a game at Calfee Park? Click for more information about customized group packages!